The company expects to deploy 100 megawatts in the next quarter. Sunrun has firmly secured its leadership position in the U.S. residential solar market. But that wasn’t enough to impress the stock market following the company’s second-quarter earnings call. Last quarter, Sunrun logged the largest quarterly installation volume in the company’s history. With 91 megawatts deployed serving more than 12,000 customers, Sunrun beat guidance and achieved 20 percent year-over-year growth. The company reaffirmed its full-year guidance of 15 percent growth in deployments, and it expects to deploy 100 megawatts in the next quarter. Revenues for Q2 grew to $170.5 million, coming in ahead of the consensus estimate of $167.7 million and up from $130.6 million a year ago. Sunrun also continued to be cash flow positive, ending the second quarter with $270 million in total cash, up $27 million from the previous quarter. The creation cost per watt was $3.12 in the second quarter, compared to $3.37 a year ago, showing an improvement of 7 percent year-over-year. Sunrun has had higher creation costs than its competitors in the past, but recent performance shows the company is coming more in line with the industry. The problem for stockholders was earnings. Sunrun reported a second-quarter profit of $7.4 million or $0.06 per share, which is down from $18.3 million or $0.17 per share last year. Analysts polled by Thomson Reuters were expecting earnings of $0.28 per share for the quarter. In response, Sunrun’s stock dropped 13 percent in after-hours trading on Thursday. The stock was down 17 percent on Friday morning, and down 12 percent at the time of publication. For instance, the install costs for solar systems built by Sunrun were $1.95 per watt last quarter, reflecting a 4 percent year-over-year increase. Sunrun attributed that to deploying a higher mix of batteries. There’s more to Sunrun’s story for the second quarter than profits, and those factors are “increasing our confidence for growth acceleration and continued market leadership,” CEO Lynn Jurich said on yesterday’s earnings call. One of the sunny spots is that Sunrun’s direct solar installation business grew by more than 40 percent year-over-year in the second quarter, which co-founder and Executive Chairman Ed Fenster attributed to investments in improving the customer experience. The company now has more than 200,000 customers in 23 states, plus Washington, D.C. and Puerto Rico. That’s evidenced by the growth Sunrun saw in its direct business, where leadership has the most control, he added. Sunrun also continues to operate its channel partner business. Sunrun leveraged its channel network to enter the market in Puerto Rico last quarter, where it’s delivering solar-plus-storage to customers. In June, Sunrun officially launched operations in Florida after winning regulatory approval to sell third-party-owned solar in the state in April. The solar company also expanded further in Nevada, as the market continues to rebound from major policy shifts. As for longer-term growth, Fenster argued that there are several reasons to be optimistic about Sunrun's prospects. For one thing, the company is in a good position to accommodate the step-downs in the federal Investment Tax Credit (ITC). Based on the Internal Revenue Service’s recently updated guidance, by incurring at least 5 percent of project costs in advance, a company can delay the step-downs in the ITC. “In the most extreme example, by making a large advance purchase in December 2019, we can continue to claim a 30 percent ITC through December 2023, rather than have it phase down to 26 percent in 2020, 22 percent in 2021 and 10 percent in 2022,” Fenster said on the earnings call. The guidance also specified that commercially owned (leased) residential solar systems will continue to qualify for the 10 percent tax incentive in 2024 and beyond. 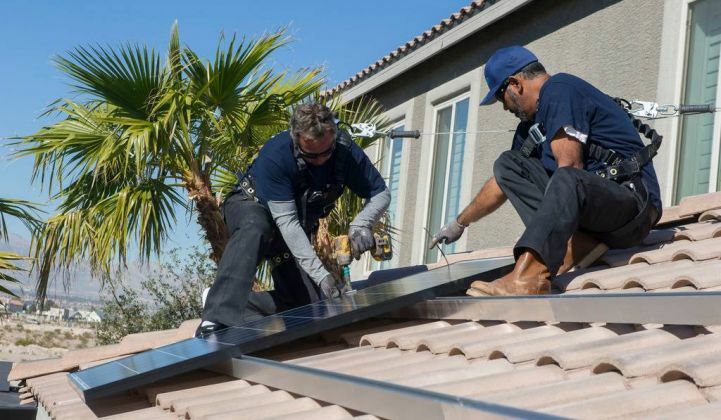 Customer-owned residential solar systems will eventually see the tax credit eliminated, however, which creates an advantage for leased solar systems over loans going forward. It was previously unclear how these projects would be treated. Based on that guidance, if Sunrun maintained its current margins, there would only need to be a 2 percent increase in residential utility rates and a 4 percent solar cost reduction between now and 2024 for the company to remain cost-competitive. Fenster argued that that’s a conservative outlook. Over the last three years, Sunrun achieved 9 percent in cost reductions. At the same time, utility rates have typically increased by more than 3 percent per year. According to a study conducted by PA Consulting on behalf of Sunrun, customer rates are expected to grow by 3.6 percent annually over the next 10 years, based on an analysis of utility capex spending, wholesale market prices, transmission and distribution costs, and other factors. “We have a plan to exceed the cost reductions necessary to maintain margins, and we expect 2024 will look better than 2018,” said Fenster. Gas and oil are already starting to lose their grip on home heating as electrification emerges as a cleaner and potentially more affordable option. California’s recently approved solar roof mandate and other state policies will also drive more widespread electrification in homes, where solar, efficiency measures and energy storage will replace the use of fossil fuels. Sunrun is not a major player in the new-home solar market. In fact, it doesn’t have much of a presence at all, while Vivint has already secured a partnership with a homebuilder. Fenster acknowledged that Sunrun’s installation volumes for new homes are small, but added that the company is now engaged in discussions with half of the top 10 homebuilders in California. “So stay tuned,” he said. When it comes to the retrofit side of the business, Fenster pointed out that Sunrun has a strong position relative to its competitors. Plus, overall demand for residential solar is strong, said Fenster. GTM Research’s latest Solar Market Insight report shows that residential solar capacity additions are forecast to be flat this year, but that’s actually good news following a market downturn. The downturn was due in part to a major scale-back at Tesla. But mature state markets also cooled and residential solar companies of all sizes had to slow down and restructure amid market changes. Fenster said that’s all changing. Vivint, SunPower and even Tesla are all projecting growth in the second half of 2018 — although Tesla’s growth trajectory in residential solar has been called into question in light of Elon Musk’s proposal to take the company private. He also sees leases regaining popularity, now that companies have improved their financial standings. He pointed specifically to Vivint, which reported strong interest in solar leasing after improving its capital structure. Sunrun offers both leases and loans, but leases make up 85-90 percent of its sales. Fenster said he thinks any company that’s able to profitably offer leasing will see similar takeup rates. He added that with rise of energy storage, the value proposition that residential solar companies can offer customers is growing, because they can now offer reliability services, in addition to clean and cheaper electricity. With wildfires raging across California, utilities there are looking at proactively de-energizing the grid to prevent fires from spreading, while utilities on the East Coast are battling strong storms. With this shift, increased reliability has become a focus for customers, Fenster said. In Sunrun’s direct battery business, takeup rates are now over 60 percent in certain parts of California and well over 20 percent in California overall. The company expects to double its storage deployments in the second half of the year compared to the first. Grid services, meanwhile, remain a small part of Sunrun’s business. Last quarter, the company announced an expanded partnership with National Grid. The two companies have started to work on a small pilot project in Massachusetts that rewards customers for helping the utility better manage the electric grid.